Webinars have been a mainstay of content marketing for a long time now. Technologies have improved but sometimes we forget just how to run a good webinar. In a busy, deadline-driven marketing department, the finer points of putting a webinar on can sometimes get lost. Here is a checklist to help you make sure your next webinar provides useful information to your audience and is a marketing success . Start on time, every time. It seems to me this should be obvious, but it fails to happen much of the time. Also, you should be ready for people who like to sign on early. Post a slide ahead of the start time that has your branding and says “Our Webinar Will Begin in 5 Minutes.” Then count it down, 4 minutes, 3 minutes, etc. Your audience has taken time out of their busy day to spend with you; respect that by starting on time. Don’t just read the slides. Make sure the presenter does more than just read the slides. Since it is all the webinar attendee has to look at, they will read what’s there quickly and the presenter needs to augment the slide content. Make the slides visually interesting. Slides that work well for a face-to-face presentation might not cut it in a webinar. Once again, in a webinar the audience has no presenter to look at, only the slides. Add color, pictures, graphics, or clip art to enhance your points and make the slides more pleasant to look at. Keep it short. If you study a webinar’s sign on-sign off log carefully, you’ll often find people start to fall off after a while. Design your webinar content to show the agenda, present the key points quickly and succinctly, provide a quick review and then go to questions. Planning for 30 minutes of presentation and 10-15 minutes of questions seems to be a good rule of thumb. Don’t try to pack too much in. If you go too long, it’s unlikely the audience will be with you at the end. Make sure there are some questions. Nearly all webinar tools allow for the audience members to ask questions, usually via a text system. Encourage your audience to ask questions during the webinar and address them at the the end. You should have a few questions already prepared, in case you don’t get enough questions or the ones asked are not of broad interest. End the webinar well. I have seen webinars end suddenly, or reveal the presenter’s desktop as they dropped out of PowerPoint. This type of bad ending looks unprofessional and detracts from the entire event. Make sure you have “Thank You” slides at the end of the presentation, with contact info and links to learn more on them. Leave them up for several minutes after the end or until all attendees have logged off. Record your webinars and make them available on your website. If you choose a conference tool that allows recording and posting of the webinar, you’ll be able to repurpose that content and make it available to those who could not make the live presentation. You can also choose to gate the content, requiring registration before viewing to add additional contacts to your database. You can even promote the recorded webinars on social media. 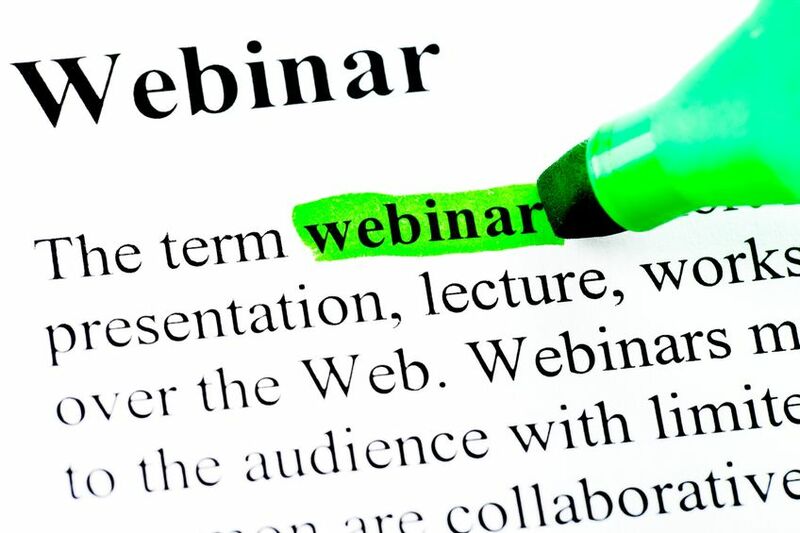 Webinars are a powerful tool to help reach your content marketing goals. There is a segment of your target market that prefers this format to others because of the personal touch of hearing the presenter in real time and the chance to get questions answered. Make them a regular part of your outbound marketing. Follow these easy tips and you’ll be successful with them. How have webinars worked for your marketing? Have you had special guests or well-known analysts involved? ‹ Is the White Paper Dead?